When my Kindle announced that I was 97% through this novel, I dreaded the last 3% so much, that I had to go for a little walk to postpone the pleasure. 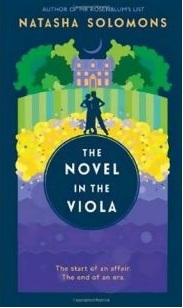 'The Novel in the Viola' by Natasha Solomon' is such a delightful book, that I hated finishing it. By the time I had clicked the 'next page button' for the last time, I had already decided that I would give the book to everyone I know this Christmas. And it will make the perfect gift too, encompassing love lost and love found; an old house and a brooding hero; a secret, and an attic. What's not to like? Perhaps it is because so much of this story is inspired by real events; the forced eviction of Jews from Austria prior to World War Two; the separation of families; the uncertainty about those left behind etc., which makes this such a compelling read. Natasha Solomons' author's note tells us that the story was inspired by her great-aunt Gabi Landau, who fled anti-semitism in Europe to work as a 'mother's help', in England. Either way, the story of Elise Landau, the novel's narrator, has us captivated from the very start. Like that other, more famous, yet equally put-upon female narrator, Jane Eyre, Elise has to repress her vivacity and true inner-spirit to fit in. Where Jane cries out in the gardens at Thornfield Hall, Elsie shouts into the sea, against the injustice she and her family have experienced. Yet here, it is not mad Bertha who sleeps in the tower of the big house, but Elise herself, alone in the garret, doomed to the monotony of a servants life, where her poor knowledge of the English language ensures her silence in a way that even Jane did not experience. And the similarities with 'Jane Eyre' do not stop there. For a start, the tall, brooding owner of the large estate of Tyneford is called Mr Rivers, the very same name as Mr Rochester's rival and Jane's cousin, StJohn. Both Mr Rivers and Mr Rochester have past loves and are men of the world, in stark contrast to the innocent Elise and Jane. The houses of both novels play a huge roll in their respective stories, not merely by providing the setting, but by giving for the heroines a safe place in a time of danger, a place where they blossom and which they come to call home. The houses suffer similar mis-haps and both Mr Rivers and Mr Rochester risk their lives for others, revealing themselves to be true heroes in their different ways. In 'Jane Eyre', our heroine has moments of telepathic imaginings, where she visualises what is happening many miles away, as when she hears Rochester's voice call to her on the wind. In 'The Novel in the Viola', Elsie uses her imagination to visualise her parents, her aunts and sister, chat and sing, like they used to do before Hitler made the world go dark. This ingenious ploy allows the author to peek into different worlds that are beyond the scope of the first person narrator, and without having to always rely on letters to fill in the gaps. Jane and Elsie are alike in other ways too. Both take great enjoyment in finding freedom out in the natural world, each confined in their own way, one by the strict social codes of Victorian England, the other by tight controls over alien non-nationals in wartime. At times, it feels like Elise is living in a different century as she walks through Tyneford House, surrounded by the ancient panelling and portraits, in the dark of the blackout, lit only by soft candlelight. On the estate too she and Mr Rivers could be characters out of a Hardy novel, working side by side on the land, bringing in the crops by hand, fuel rationing putting pay to any mechanical assistance, sharing a picnic on an obliging soft mossy bank. It would seem idyllic but for the duelling aeroplanes battling overhead. What a wonderful description of his hair, so vulnerable yet magical too. There is something of the painter here too, each page replete with descriptive similes and metaphors. Once, when Elise is in fear for her life, she imagines that she is being chased not by a German, but by 'Black dogs with white teeth and wide red jaws. They weren’t dogs but wolves escaped from my old fairy tale book.' It is no co-incidence that the red, black and white colours described here are also those of the infamous Nazi flag. Her narrative is so visual, in fact, that I feel as if I have walked through the vast county estate, opening up the seventeen gates as I pass along, have felt the wind cut at my cheeks and have tasted salt from the sea on my lips. And so this is what I wish for my family and friends this Christmas,when too much food and drink have been taken: a brisk walk in the fresh air of the English countryside close to dark, at a time when life seemed more simple, but in truth, was heartbreakingly complicated; sad but utterly, utterly beautiful. P.S. 'The Novel in the Viola' is also published as 'The House at Tyneford' in some territories.